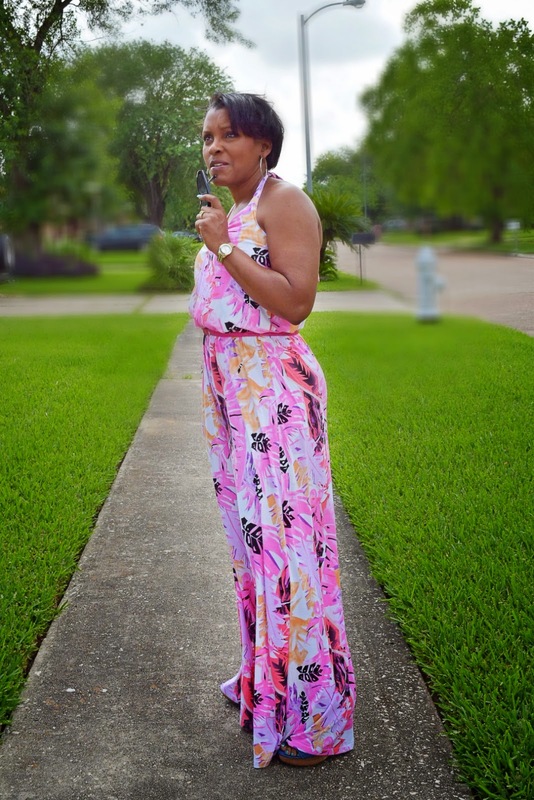 Every time I see a wide leg jumpsuit, I think of my Mom. You see when I was a yungin… jumpsuits were the uniform to wear. It seems that every thing that was once is now, and any of the fashions which were then, are here again. It is back, “OLD School” is new again. 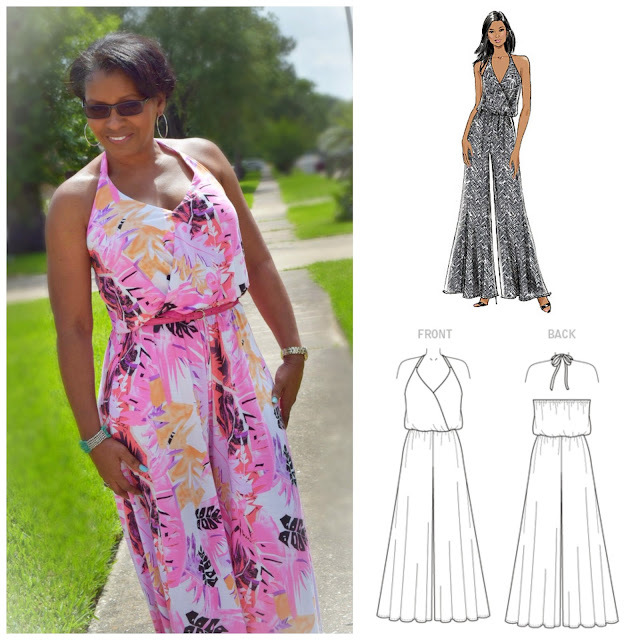 I have made several jumpsuits in the last few years, a couple self drafted and a couple using patterns from Vogue and McCalls. Now, everywhere I look, I see a rise in the number of patterns available for this fun piece of clothing, and an onslaught of various renditions of said patterns by so many on Pinterest. 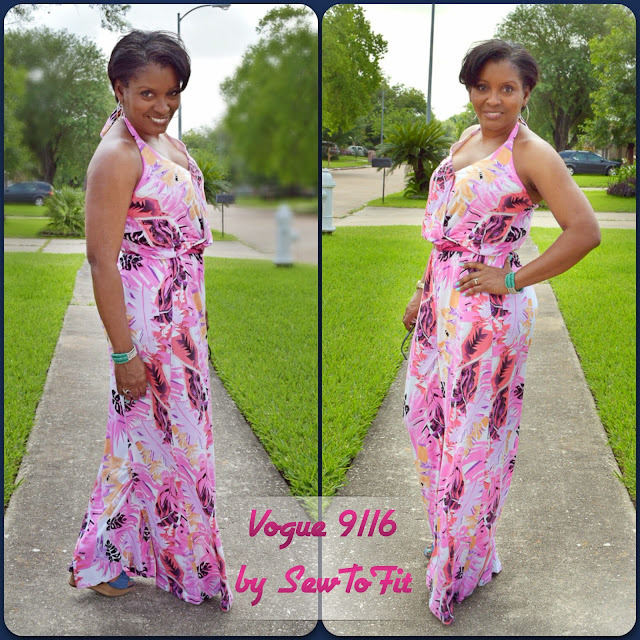 This time I made the new Vogue 9116, although we all know it is really the old vogue. Actually, it is the same jumpsuit I have been wanting from my sister for the last 5 years, except her’s is in black. I will get to that color another time. I just had to make this fun print for the summer months, poolside parties, and beach getaways. All was very easy. The pattern instructions were easy, the sizing was easy. I cut a size 14 top and 16 bottom. Removed 4″ from the pant legs because they were “WIDE” for sure. I hope you are enjoying this resurgence of jumpsuit fashions. I know my Mom is enjoying all the patterns coming back. Something she is really familiar with. You look fabulous, Ms. Lady. Yes, jumpsuits are to stay. That's beautiful and you wear it well. There are an awful lot of jumpsuit patterns available but you made a great choice. It's beautiful! Thanks Cennetta. I want to wear this everyday. Thanks Michelle. I hadn't thought I would love this so much. Thank you Faye. I thought I had everyone of the patterns until I went on Pinterest and searched. Oh, I love this so much! 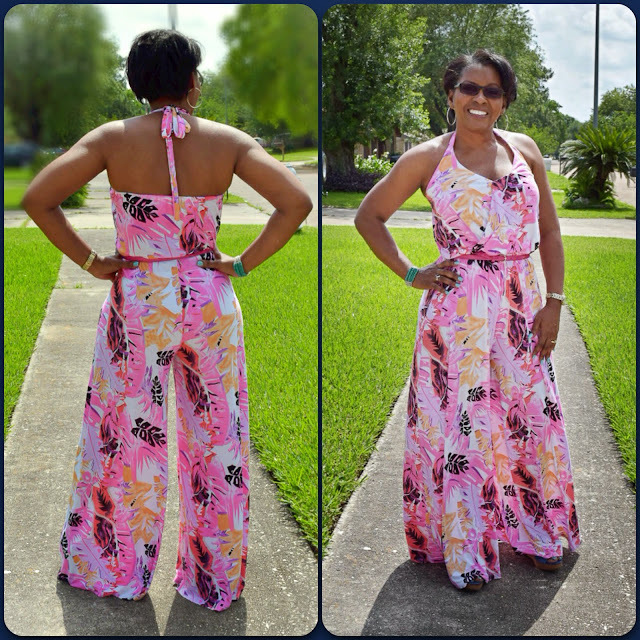 this is a sensational jumpsuit! I love the pretty pink and white print, looks so pretty for summer. You look wonderful, and ready for the poolside! Andrea, this is STUNNING on you! It fits great, the fabric matches your personality, and the fit is spot on! Love it! This looks absolutely gorgeous on you, the color, the print. I like it better than the RTW ones available. Where did you find this beautiful fabric? Stunning!